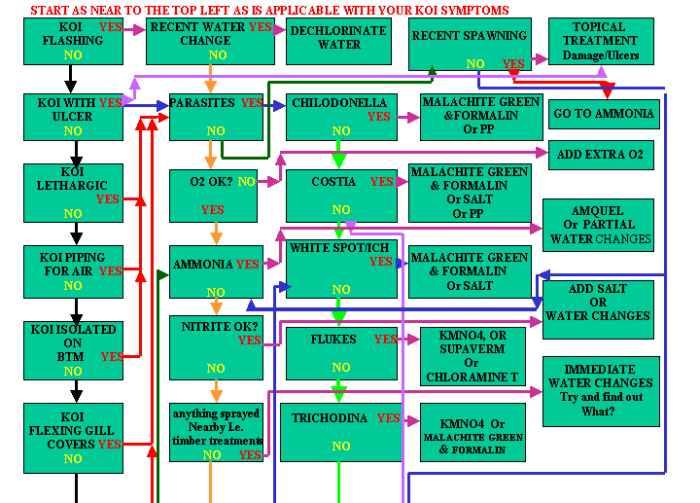 Decision Tree Chart & Diagnosis of Koi Disease. The author and koi-unleashed can accept no responsibility for inferior attempts at following these charts and / or erroneous interpretations of the charts or attempts to align and compare( in a best fit scenario!) our descriptions of disease symptoms with those the reader is experiencing; we accept readers aptitude for understanding will vary greatly. While every effort has been made to make this chart as accurate as possible, therefore, please use this chart, but understand, it is at your own risk/discretion. of you do not understand this chart and its implications or you cannot follow it you are strongly urged to seek professional advice! Important please read first before proceeding with the charts! 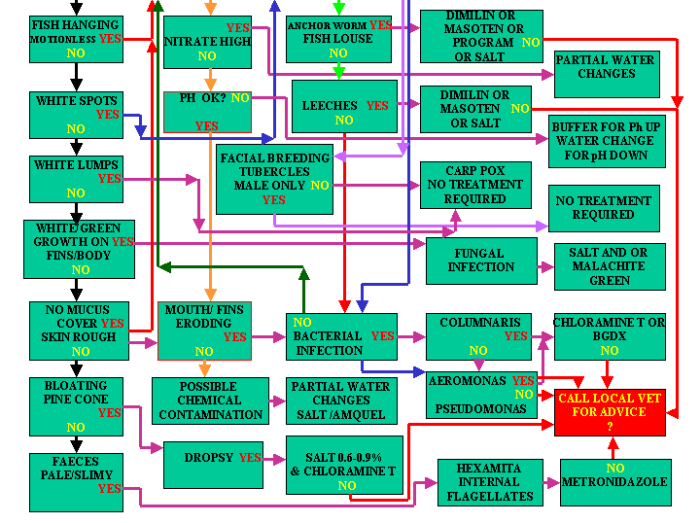 It is important to understand that the diagnosis chart shown here is ONLY intended as a guide and only intended to point the user in the right general direction. It is NOT a definitive device, although every effort has been made to make this chart accurate and useful. Although accuracy was deemed to be essential when developing the chart, the chart can never be 100% successful due to variations in symptoms, this would be largely due to the fact that pathological symptoms in all diseases can manifest themselves in more ways than we have the space to describe and allocate resources to. Also it's worth bearing in mind that people's perception of the descriptions of disease symptoms vary enormously. Where ever possible, no matter where the chart eventually points you to; the chart and its possible treatments; should be read in conjunction with all available data both on this site and other sites and in books, for full descriptions of the disease and symptoms and all available treatments and dose rates, the chart does not make any recommendations on dose rates or which of the many available treatments you should eventually choose. That is your choice and yours alone, based on your circumstances. At the end of the day if you have the slightest doubt in what you appear to be treating and how to treat, please seek professional advice. You will have to tell the printer to print in landscape as it contains two sides, then trim either the bottom of each sheet to fit, then tape together with clear tape then if you can laminate the final chart. I hope you find this chart of real use in the future.